Every brand wants to create more content—be it TV ads, e-books, or infographics. The question then becomes whether brands have the internal resources to turn those ideas into assets. In the past, many companies would outsource to agencies. But as content marketing has taken over the last decade, these companies have exercised their own agency, if you will, bringing their efforts in-house. 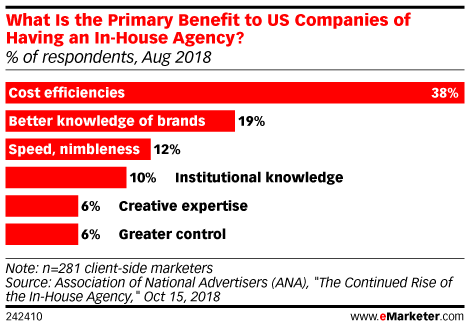 Earlier this year, the Association of National Advertisers surveyed 281 American marketers to find out why in-house agencies are on the rise. Not surprisingly, cost was the most common benefit. Brands can save a lot of money by avoiding expensive retainer fees. The survey also found that 78 percent of respondents currently have an in-house agency, an increase of 20 percentage points since 2013. While it’s true that having an in-house operation will save money, prioritizing that too much can restrict a brand over the long term. As the study highlights, most marketers aren’t necessarily going down this path for more control or creativity. Those benefits don’t have to be mutually exclusive. Brands can balance savvy budgeting with other factors like creative ambition and strategy. As a company that built a global freelance talent network, we’ve seen firsthand the benefits of hiring folks who have niche expertise to complement internal teams on individual projects or campaigns. Take video production, for example. As video increases in popularity, the temptation to create video content is high, but brands must be careful that they’re not cutting corners when it comes to the quality of their production. Unless your company is staffed with professional videographers and editors, you’ll need to hire externally. Contently did this recently with our new brand video. We workshopped the narrative and design in-house but relied on an external vendor to help with shooting and post-production. In the long run, outsourcing certain responsibilities is well worth the initial cost if the result is excellent content that impacts your business.